The USS Discovery is still hot on the trail of Spock, but they get caught by an anomaly that may be more than it seems. Meanwhile Stamets and Reno are trying to help Tilly stay free of her parasite while Saru starts having a few problems of his own...like the fact that he may be dying. 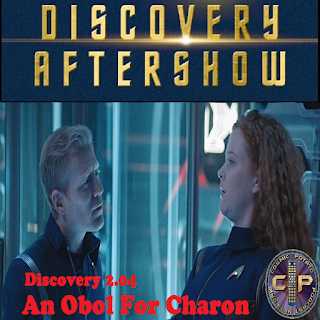 Join Shawn, Rick, John, and Virginia as they break down the good and bad of episode 4 of Star Trek: Discovery's second season. This episode can be heard right here on the website. You can subscribe at places all over the internet so that you'll know as soon as a new episode is available. We're on Apple Podcasts, Stitcher, Spreaker, and Podcast Addict on the Android store. We've also now been made available on Spotify! If you'd like to make a comment about the podcast or about Star Trek: Discovery and tell us something that you'd like to hear us discuss then look up our group on Facebook by searching "Discovery Aftershow" or follow us on Twitter @CosmicPotatoPod. You can email us at mail@cosmicpotato.com or you can send us a voice mail or a text message at (205) 642-8380.